​The Basset Bleu de Gascogne is a scenthound that originated in the Gascony region of France. It was developed to hunt in packs for small game such as rabbit and hare. They are one of four Gascony hounds, the others being the Grand, Petit, and Griffon. Although the popular Basset Hound was created in England, there are actually six recognized breeds of basset, the other five are from France. They Include the Basset Bleu de Gascogne and its “cousins” the Basset Artésien Normand, Basset Fauve de Bretagne, Grand Basset Griffon Vendéen, and Petit Basset Griffon Vendéen. Today the Basset Bleu de Gascogne is kept primarily by hunters and is rarely seen outside of France. Bassets have been known throughout France for centuries, with written records dating back to 1585. It is unknown how this type of dog was created, some have suggested they descend from other short-legged breeds such as Dachshunds or Corgis. Other experts believe that dwarfed scenthounds (possibly from the Saint Hubert Hound) were the first bassets. The latter is the more preferred theory, however, their origin is further debated as to whether or not this occurred multiple times or if different breeds were simply crossed with existing bassets. However they came into existence, eventually, nearly every type of French hound had a basset variety. It is believed that some of the oldest of these breeds are the Basset Bleu de Gascogne and the now extinct Basset Saintongeois. A painting from the 1300s depicts a dog very similar to today’s Basset Bleu de Gascogne. The Basset Bleu de Gascogne has long been overshadowed by the other French bassets. By 1911 it was considered either very close to extinction or already lost. French breeder M. Alain Bourbon restored/resurrected the breed (there is quite a debate as to which of the two occurred). Regardless, at the time outcrosses with other dogs such as the larger Bleu de Gascognes and most likely the Basset Artésien Normand were made. 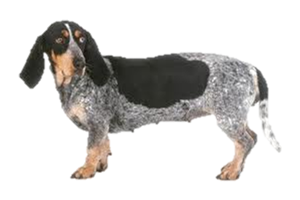 Today the Basset Bleu de Gascogne remains rare and has some of the lowest numbers among all the French hounds. It is certainly the rarest of the bassets. Most of the surviving dogs are kept as pack hounds inside of France, and a few have found homes as companions, but not outside its homeland. Is the Basset Bleu de Gascogne Right for You?